Our scope of services means we cater to the health needs of the entire family, from toddlers in their developmental years to special considerations of the elderly. As a team, we take a comprehensive approach to the wellbeing of our patients by providing chiropractic care, podiatry, massage therapy, exercise physiology and pre-natal care. At Health plus Chiropractic, our chiropractors practice gentle chiropractic adjustments and treatments with a high regard for safety and effectiveness, in order to provide relief for a wide variety of conditions. Chiropractic care can help you through all seasons and all stages in life, from newborns, to the growing pains of adolescents, to the restorative care of adults. We have a comprehensive approach to foot care and our podiatrists are here to help you put your best foot forward by using the most advanced technology and podiatric techniques available. There are many problems that are associated with the feet, so whether you are in need of orthotics, biomechanical adjustments or general podiatry treatments, we will provide thorough knowledge of everything related to the lower limbs and feet. Health plus Chiropractic offers therapeutic and relaxation massage by qualified and experienced massage therapists. Massage therapy will help relieve stress and improve muscle strength, leading to more energy, better posture and mobility and less likelihood of injury. Health plus Chiropractic Exercise Physiology provides workouts, rehabilitation and education for: muscular or joint rehabilitation strengthening; managing diabetes; peripheral neuropathy; cardiac rehabilitation; managing various risk factors for metabolic conditions; chronic fatigue; arthritis and osteoporosis. 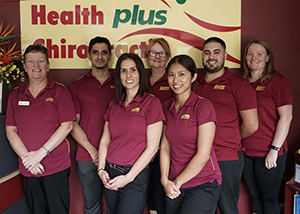 The healthcare practitioners at Health plus Chiropractic are here to support the patients in achieving their health goals through integrative practices. With a talented team that dedicates themselves to providing the highest quality of care, our service is what many patients have come to recognise and count on. When you visit Health plus Chiropractic for the first time, you will be asked to provide information about your health and fill out an administration form. The first appointment will take approximately 1 hour for chiropractic and x-rays or other diagnostic tests may be required for further investigation. Initial consultation for massage therapy is also 1 hour. Administration forms are required to be completed along with patient health history information for massage therapy services. Your first podiatry consultation will be for 30 minutes and requires the completion of an administration form. It is important to advise your practitioner about everything related to your health, including a thorough medical history and all medications you currently take. This will provide us with a background about your health, such as surgeries, accidents, the onset of your condition, and other details affecting your current health. Prior to any treatment, the practitioner will inform you of what to expect, and explain the types of treatments and preventative measures available to assist in the healing process. You will be advised on exercising, stretching and posture maintenance to ensure optimum health and wellbeing. Health plus Chiropractic accepts most major credit cards, (except American Express), and we have HICAPS facility which enables those with private health insurance to claim their rebate. Our practitioners are registered with the Department of Veterans’ Affairs and hence we provide services for those seeking treatment through this Department along with Workers’ Compensation schemes. We offer pre-employment medicals, spinal screens and workplace rehabilitation programs. We stock a range of products such as Posture Poles, Posture Medic, lumbar supports, pillows, (contoured, adjustable and therapeutic), lumbar rolls, heat and ice packs, Metagenics nutritional products, Sombra pain relief heat gels/ice gels and Revere Comfort Shoe range. Why not spoil that someone special with a gift voucher.